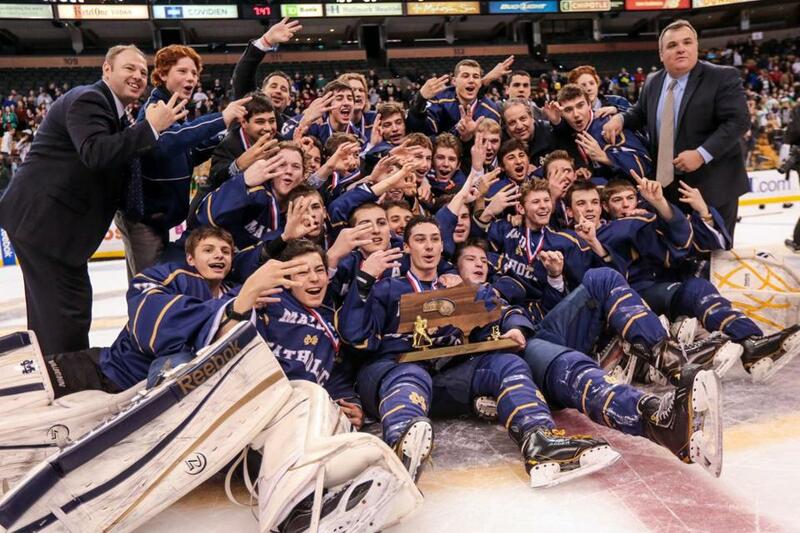 Malden Catholic won its third straight Super 8 title this year. For high school sports fans, the winter never seems long enough. Yes, there was plenty of snow — and days off from school — but in places such as Brighton, Burlington, Westford, and Duxbury, they enjoyed every minute. That's because those communities celebrated state championships and there’s nothing like a trophy to make staying indoors worthwhile. Whether it was a senior capping off a great year (Olivia Healy of Reading) or a freshman getting her first state title (Samantha Rubin of Wellesley), success found many homes. From Barnstable to Swampscott, it was a season of great accomplishments. The following are 10 moments that stood out among the countless athletic stories in Massachusetts. Danielle Coughlin wasn’t trying to make history Wednesday, Feb. 20. She was just trying to help her team win a state title. North Andover entered the Divison 2 state wrestling finals behind first-place Winchester. Wrestling at 106 pounds, Coughlin needed to beat her Winchester opponent or North Andover would be facing a deficit it probably couldn’t overcome. She did, winning 5-3, and setting the Scarlet Knights on a run that led to their fourth straight state championship. The state title was the first by a female wrestler in this state, an amazing feat for a girl who was also the team’s cocaptain. Male, female, whatever. The kid can wrestle. Smith Academy took the floor at the DCU Center for the Division 2 boys’ basketball championship with “I wear orange for Bobby” T-shirts and the only thing that seemed out of place was the sea of orange supporters for a school with colors of purple and white. The first quarter ended and I was curious: Who is this Bobby? Turning from press row, I asked the closest kid, one wearing a Philadelphia Flyers T-shirt in the front row. Who’s Bobby? The answer was, “Me.” After a pause, another question. Why the T-shirts? “I have leukemia.” Bobby Gagne was diagnosed with leukemia last July and the T-shirts and orange were in support of his battle. I don’t remember the final score of that game. But I remember Bobby. The snow storm that hit Massachusetts Feb. 8-9 forced the postponement of MIAA events across the state. But if you’re a swimmer, the snow didn’t mean the sectionals were delayed, it meant they were canceled. With its biggest events taking place at MIT and Harvard, swimming didn’t have the flexibility of high school sites. Snow meant no MIT, which meant no sectionals. And when the MIAA decided to cancel the Western Mass. sectional as well, hundreds of swimmers’ seasons came to an early end. But pressure, from parents, schools, and even Olympians Missy Franklin and Ryan Lochte, convinced the MIAA to reconsider. Sectional swimmers were allowed at the state meet and officials handled the extra bodies with ease. The storm subsided. With just seven MIAA schools out of 373 competing in boys’ gymnastics, you’d wouldn’t think the Jan. 16 decision to drop the sport from state sponsorship would attract much attention. But thanks in part to Olympians Aly Raisman, Peter Korman, and Tim Daggett, the sport isn’t going away without a fight. Although a March snowstorm postponed Braintree coach Richard Ellis’s appearance before the MIAA board of directors, he’ll try again at the May 1 meeting. Meanwhile, Andover won what could be the final MIAA state championship, led by senior all-around champion and Gymnast of the Year Brian Manning. There’s pressure enough standing on the free throw line in a tight game with your teammates counting on you. And when you do that just hours after watching your stepfather die, it’s beyond what any teenager should face. But Fenway junior guard Cadejia Matthews found the strength not only to play in the Division 4 North final as well as the state final two days later, but to excel. Matthews hit two crucial free throws to lead Fenway past Whittier in the North final, then scored a game-high 15 points against Greater New Bedford to help Fenway win the state title. “I played my heart out for him knowing he was still looking down on me,” said Matthews. The right knee brace is the only sign it hasn’t always been good for Central Catholic senior Casey McLaughlin. After missing time last winter with a knee injury, McLaughlin came back stronger than ever. On state championship Saturday, she was the day's high scorer on the DCU court, scoring more than half her team’s points (27) in a 53-48 win over Holy Name. McLaughlin also played great defense on Holy Name’s 6-foot-2-inch center Brianna Frias. “She’s our everything,” said coach Sue Downer. “She’s our emotional leader, our physical leader, our vocal leader. She’s just everything.” Including a state champion. Maybe you’re not sure how to pronounce his name, but really all you need to know about Weston swimmer Jack Blyzinskyj is that there’s never been anyone faster in the pool. At the Division 2 meet at Harvard, the University of Florida-bound senior broke the state record in the 50 free with a time of 20.50 seconds. That’s down and back in 20.50 seconds, an almost see-it-to-believe-it time. “I’m pumped about that,” an excited Blyzinskyj said after Weston had won its 21st state swimming title. “That’s the highlight of my life right there.” And to those in attendance that day, sad to say but his mohawk is gone. It was a nice look.